For good soil & seasonal care: Spread ½” to 1” of Bu’s Blend over planting area (for edibles and grass), watering well (for roses and other bushes), or drip line (for larger trees). Water in (or let the rain do it for you) and let the microbes do the work. Repeat every 3-4 months. For new plantings: Spread ½” to 1” of compost over the planting area, water deeply, and let the area rest for a couple days up to a few months, if possible. If not, it’s cool, go for it. Plant whatever you’re planting. Put a nice handful or two of Bu’s Blend in the bottom of your planting hole and say something wonderful to the plant. Plants like to be loved just like the rest of us. Then, broadcast another ½” of Bu’s Blend over the newly planted area. Sit back and watch the magic. Cover mulch: Spread 1-1½” of Bu’s Blend over your beds, pots and planters. Do not work into the soil. We repeat, do not work the soil. Let the irrigation or rain work the compost into the soil. Is that cool or what? For poor soil: Break up the soil and apply up to 2” of Bu’s Blend on top. Water deeply & repeat every 2 weeks or so until soil improves. The water will draw beneficial microbes deep into the soil, where they will work to improve soil structure and vitality. Ingredients: Dairy cow manure, straw, wood chips, and concentrations of yarrow, chamomile, valerian, stinging nettle, dandelion, and oak bark. 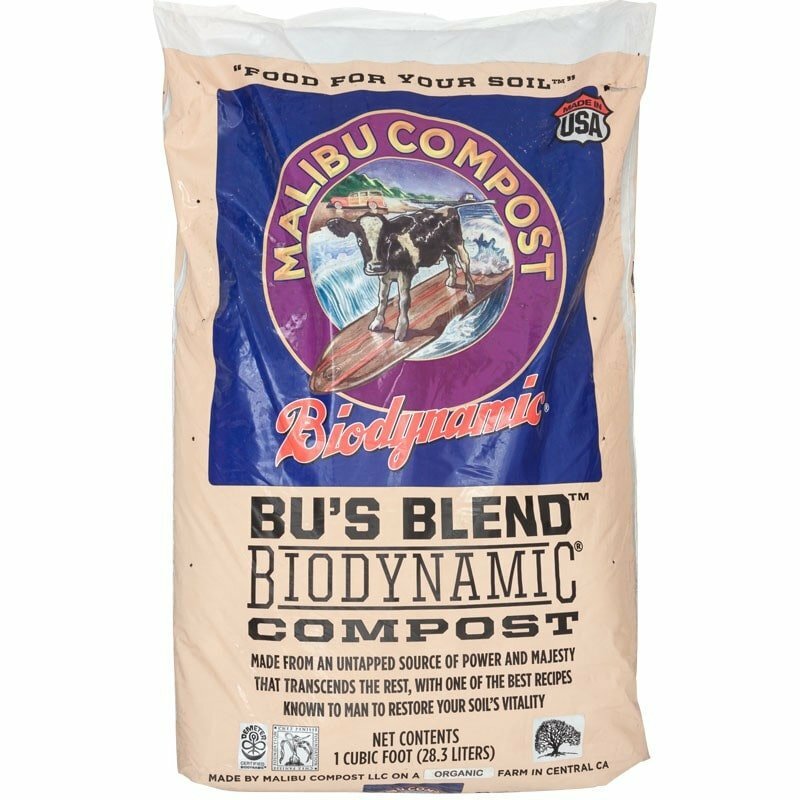 Bu’s Blend™ Biodynamic® Compost is full of naturally occurring microbial diversity which nourishes soil-inhabiting organisms, saves water and serves as a source of support for planting and managing soil health. Made from a base of the best organic dairy cow manure in the country, Bu’s Blend™ is free from GMOs, pesticides, growth hormones, sewage sludge and synthetic chemicals. For use with seeds, starter plants, established plants, trees, shrubs, lawns or as a cover mulch.